A total of 160 foreign students from universities in the Yangtze River Delta region finished a three-day visit to Shanghai yesterday. 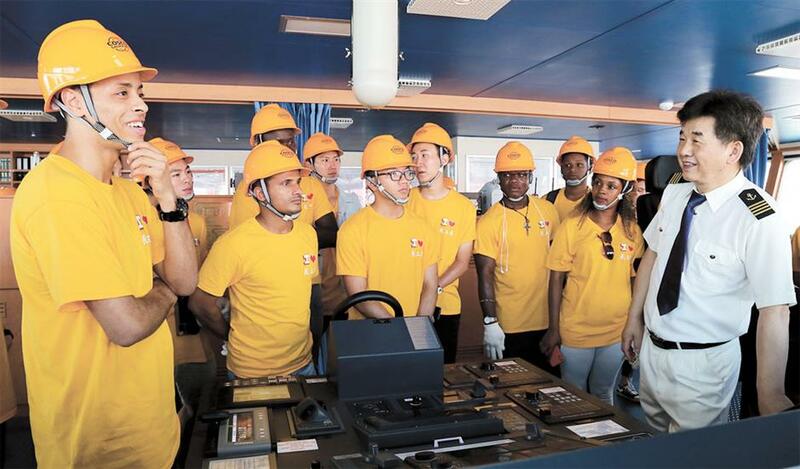 Foreign students board a container ship during a three-day visit to Shanghai. They were invited to see achievements made in the city over the past four decades. They were invited to visit the city to see the achievements the region has made in the past 40 years since reform and opening up, as well as Shanghai’s successes building itself into a global center of finance, trade, shipping, science and technology. During their stay, they visited the Yangshan Deep-Water Port and boarded a 20,000-ton container-ship. They also visited Zhangjiang Hi-Tech Park, Shanghai Tower, ShanghaiTech University, Donghua University and Shanghai Maritime University. The trip, organized by educational authorities in Shanghai and Zhejiang, Jiangsu and Anhui provinces, was also expected to promote exchanges among international students in the region and regional cooperation in education. All participants are recipients of local government scholarships. Hoang Thi Lan Anh from Vietnam, who is studying international economics at Nanjing Normal University in Jiangsu, said she was happy to participate in the tour. “I have been in Nanjing for three years and witnessed the change of the city in the past three years. And now I’m in Shanghai for three days and was briefed on the changes of Shanghai in the past 40 years,” the young woman said.